Absorption rates for new rental and for-sale multifamily homes remained near post-recession highs in the fourth quarter of 2013. According to data from the Survey of Market Absorption of Apartments (SOMA), completions of privately financed, unsubsidized, unfurnished rental apartments in buildings with five or more units were up strongly for the four quarter period ending with the third quarter of 2013. A total of 129,200 such apartments were completed for those four quarters, compared to 88,700 a year earlier. 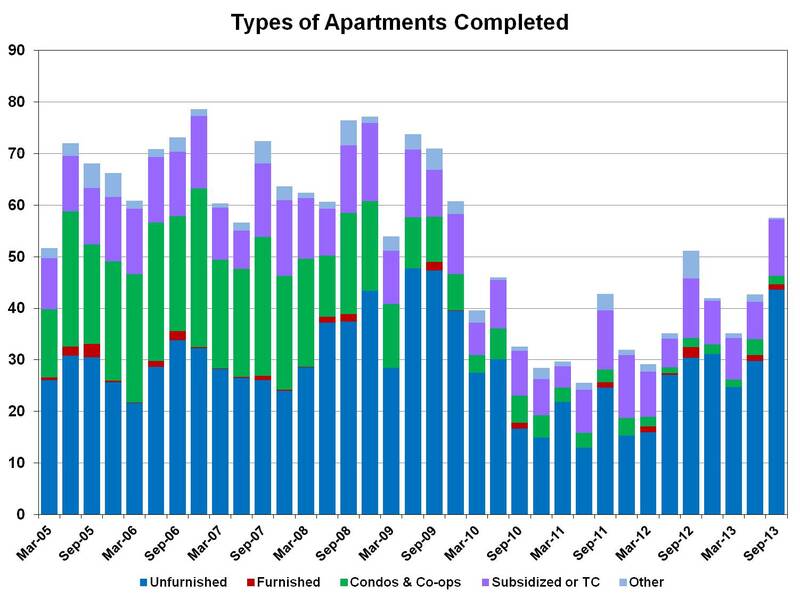 Non-seasonally adjusted three-month absorption rates (units rented after construction of the property is complete) for third quarter completions (rented during the fourth quarter) remained steady at 66% compared to 65% a year earlier. 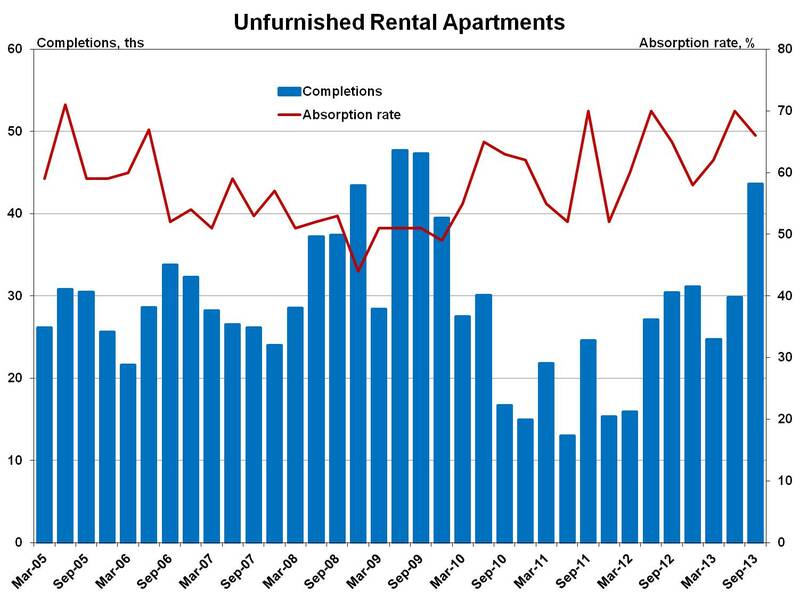 Absorption rates for rental apartments have been generally rising since late 2008 as rental demand increased as a result of the housing downturn. 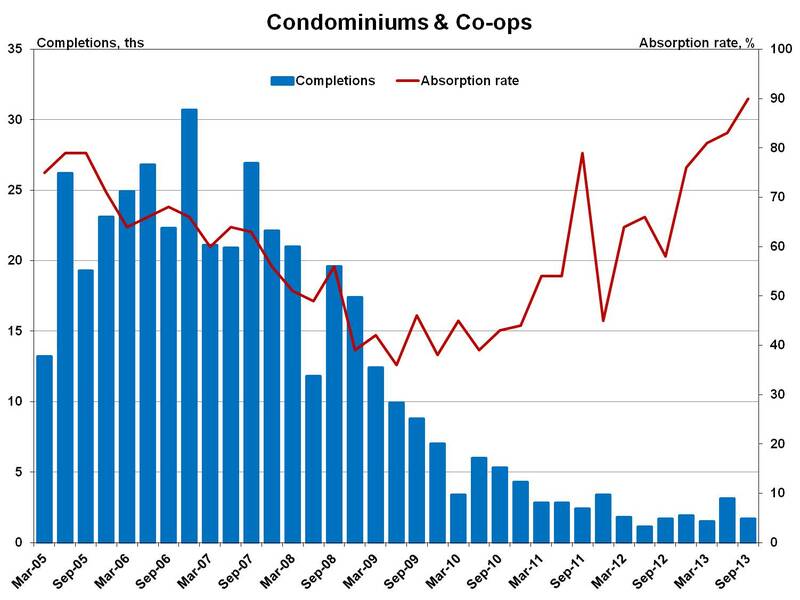 In contrast, condo and co-op completions remain at historically low levels, with 1,700 for-sale multifamily homes completed during the third quarter. While construction remains at low levels, the 3-month absorption rate for for-sale multifamily has improved significantly, reaching 90% for third quarter completions. The SOMA data also reveal that for properties with five or more units approximately 10,900 Low-Income Housing Tax Credit or other federally subsidized units were completed in the third quarter of 2013. This is down slightly from the 11,600 affordable units estimated completed during same quarter in 2012. The affordable share, LIHTC and other subsidized units, of multifamily completions was 19% for the third quarter.